Accessory Experts supplies and installs Firestone air bag suspension kits as well as compressor level command kits. We also supply and install SuperSpring suspension products. Please call us for pricing and availability at 403-264-4808 or 403-0991-6964. Ride-Rite™ air helper springs mount between the frame and the suspension of light-trucks, vans, and motorhomes. The heavy-duty convoluted air springs will handle all leveling needs with load carrying capacities between 3,200-5,000 lbs per set*. Upgrading your air suspension system with an air compressor and in-cab gauges allows you to control your springs from within your vehicle. 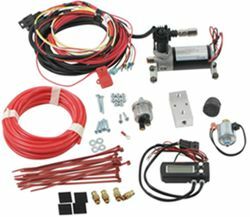 Air Command kits come with all the components needed to upgrade your suspension system. 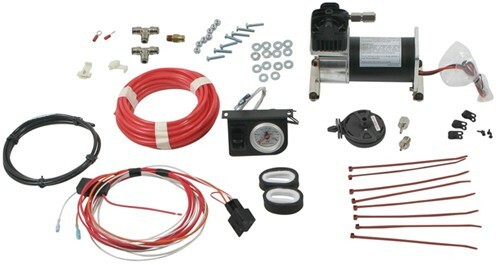 Air system components vary from kit to kit. Digital air command systems have a digital control panel that is installed in the cab of the vehicle, allowing you to constantly monitor and adjust your air spring pressure. Digital control panels also detect and alert you when your air spring pressure is too high. Wireless air command systems allow you to inflate and deflate your air springs with a remote control from inside your vehicle or up to 50 feet from the vehicle. An automatic-inflation air kit allows you to set a preferred vehicle-ride height. When a load is added to or removed to the vehicle, the air-spring system will automatically inflate or deflate the air springs to the pre-set, user-determined height. As a vehicle with rear leaf springs comes under load the factory springs react as they are designed too. The center of the springs move vertically causing the overall leaves to flex and “flatten” out. This movement in the factory spring activates the SuperSpring through the rollers at the end of each leaf. Because the SuperSpring rollers a re under tension, a movement in the factory spring causes them to move, seeking their new point of least resistance. This simple roller principal allows the SuperSprings to activate and deactivate automatically, free of any manual adjustment. For additional installation information please view your vehicles specific install instructions at this site under “installation instructions” or contact the SuperSprings tech support line. This toll free line (866-898-0720) is manned seven days a week, between the hours of 7:00 am and 5:00 pm (PST) for your assistance.